the day I have relaxed and read. Once I even got out of bed just one single time during the day, to eat in the traditional Greek specialty restaurant "KFC" (Kentucky Fried Chicken). But my concentration was so bad, that I dropped my Coke on the way from the bar to the table. According tot he manager, it’s no problem, and I should just change the table. Said and done. Unluckyly, when I moved towards the new table I dropped my fries. A classic. Schilli embarrases himself. Cheers to the staff of KFC. As I sat safely on my place, they brought a new cola and new fries. But in the evenings I couldn’t say 'no' and threw myself, with friends from the Hostel, in the Athenian nightlife. No, not the big clubs or one of many other party offers the city. This is not me, or not always and not at this time. Dancing on narrow dance floors with electronic music and strobe lights, is a thing I can do in Germany as well. I’m muc happier when I can visit the beautiful places oft he city awith a cheerful group settle down for a glass of wine. Maybe I'm getting old, maybe I was just a little comfortable in the past week. Anyway, it was great. Every evening we cooked together and strongly ignored the curfew at 11pm. The time to leave the common area of the hostel was defined by water attacks by the neighbors. Once a few buckets of water landed on or beside us, we went. We, that is Terry (GR), Michael (NGA), Solène & Élodie (F), Merlin (D), Daniel & André (ROU) and some other boys and girls from the hostel, depending on mood and availability. 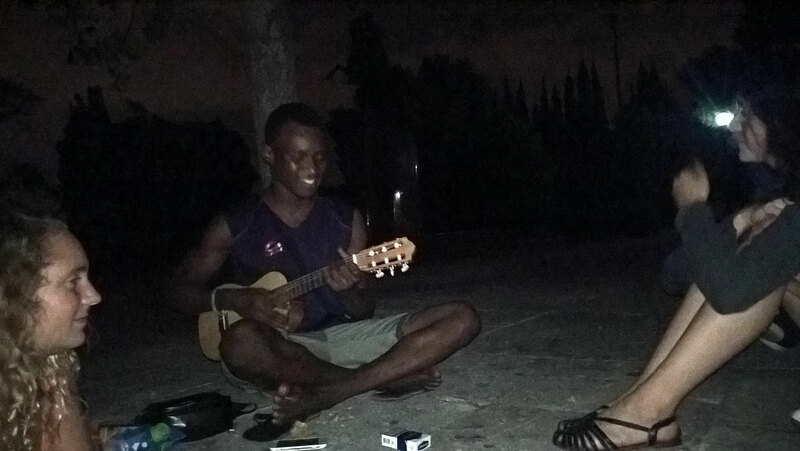 So we moved, of course, with the Guitarlele, in a nearby park, to the wonderfully illuminated and gigantic Panathinaiko Stadium or to the beach. The beach party is worth mentioning. At first I was a little disappointed. But it was obvious that the beach of the city is not as beautiful as the partially secluded beaches of these islands. But that you barely see stars because of the light pollution of the city, was a bit sad. 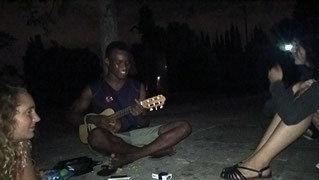 But we swam, got some beer and wine, played some music and chatted. Gradually, a group of Orthodox and Muslim Greeks joined next to us. Armed with drums and traditional music from speakers, they launched a big party. After they lit a bonfire and integrated us, we have danced together until the early morning hours. Weird ...uncoordinated ... spontaneously ... emotional ... fantastic. It reminded me of Indian dance scenes from the books of Karl May. But just a few oft he Greeks reached the state of trance and we enjoyed the spectacle as beeing a part of it. At dawn, the taxi brought us back to the hostel. Oh, and there is apparently no problem in Athens to fill the taxi with one or two people more than available seats. make Athens special and what it probably means to live in the troubled and historic city. It is a beautiful metropolis that shows many different faces in many different places. Sometimes positive, sometimes negative. I really like to visit Athens again with more energy. 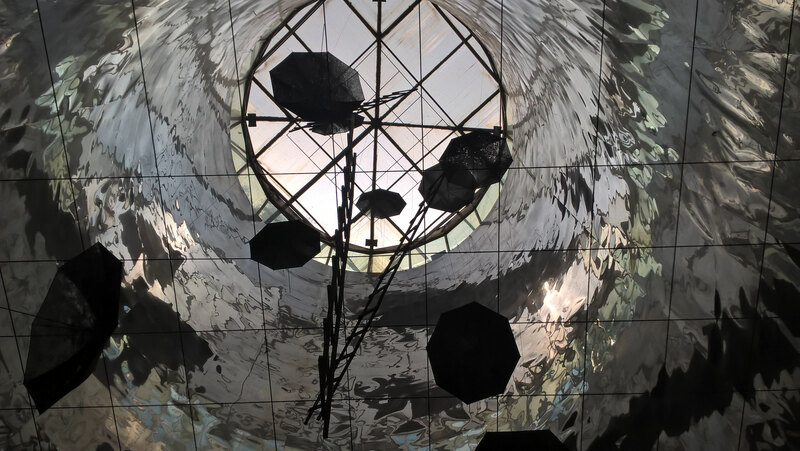 For this trip, however, I‘ve decided that seven days in Athens are enough and an indefinable feeling pulled me on. So I booked a hotel in Delphi. 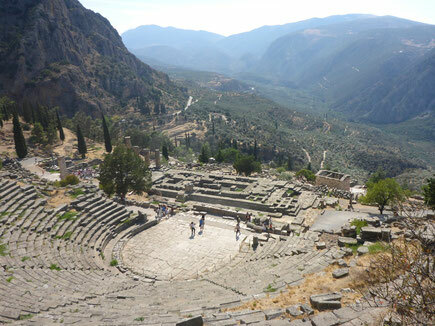 Unfortunately, the small village, northwest of Athens, which is famous for its ancient oracle, provides no hostel. But for me it’s been perfect. Since I preferred a small single room due to my illness. I felt better indeed, but I know my body and I booked, preventively, some place to rest peacefully. 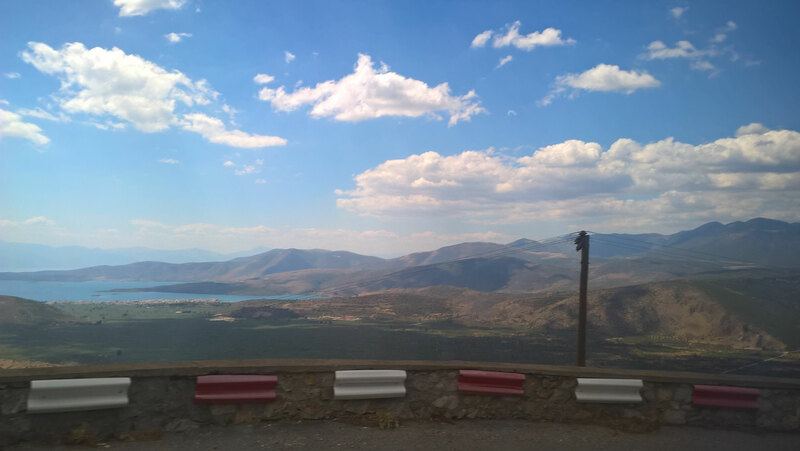 I took the bus into the mountains to Delphi from the northern bus station in Athens. And what a fun ride I had?! The coolest bus driver the world has ever seen, brought us, elegant in an open white shirt, sunglasses, frappé and of course chain-smoking to Delphi. Along the way there were two small toilet stops and - more importantly - smoke breaks for those, like me, who do not want to smoke on the bus. The village is actually a small village. Wonderfully located halfway up the mountain Parnassos, about 15 km from the Gulf of Corinth, it offers not much, besides the archaeological excavations, the associated museum and a unique landscape. Just right, to keep me busy with small, informative day trips and time to recover. For three nights, the village is my home. Zeus, the old warhorse, declared Delphi, like in the former mythology of the earth's mother Gaia, as the center of the world. He made two golden eagles start from both sides of the earth, and they met here, about 624m from my room. He threw a big stone down from Olympus to marks this point. 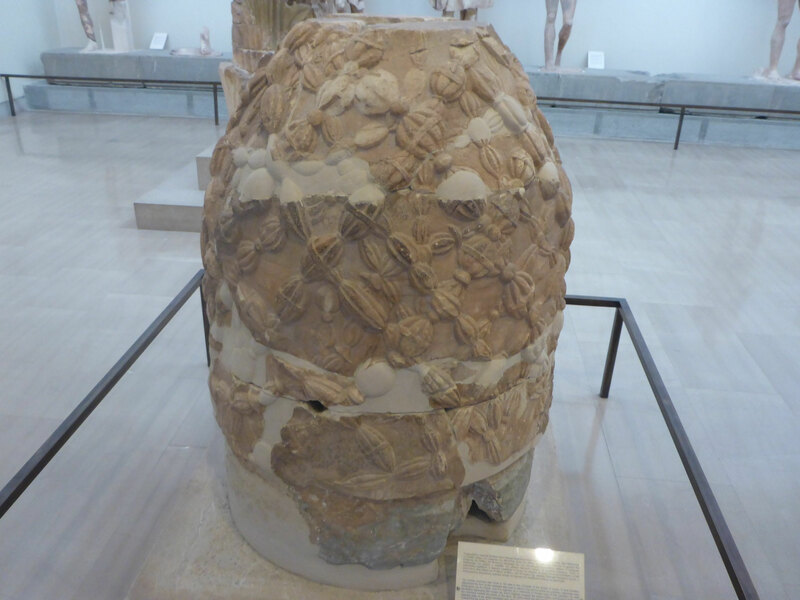 And of course, this stone, or one of his successors, is one of the highlights in the museum of Delphi. It is very amusing, what mythology tells about this exciting place. Unfortunately, I will not write about it, if your interested you can google it. There you will learn, why a special species of Snakes, the „Pythons“ are called like that. So I visited the sanctuary of Apollo. Although Apollo is not my favorite god Dionysus. But Dionysus represented Apollo at Delphi, when he was on vacation. So all good. It is impressive what the ancient Greeks / Romans etc. invested and created to indulge their cult. It’s insane if you imagine how this place must have looked like. And imagination is mandatory when visiting the ancient ruins, otherwise it can be really monotonous. 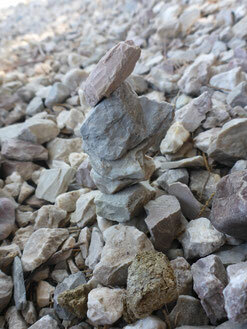 A German child who crossed my path, said to his Muttter: "Wow Mom, those are many stones. But I have no desire to see stones. Can I play Gameboy? ". The only thing that surprised me, was that he did not ask for Pokémon Go. To me it was not boring at all. I felt as a scientist or archaeologist and several times I left the usual tourist routes, trying to discover other things. Of course I’ve respectfully accepted the appropriate warnings of the security guards and ignored them. But everything's alright. I was very careful. There are another billion tourists and generations supposed to see this place. I’m aware of that. As always, I have found great pleasure in the ancient theaters. I'm just a stage type. In private and profession. That is and remains my passion. I’m glad that I’ve been able to confirm this. 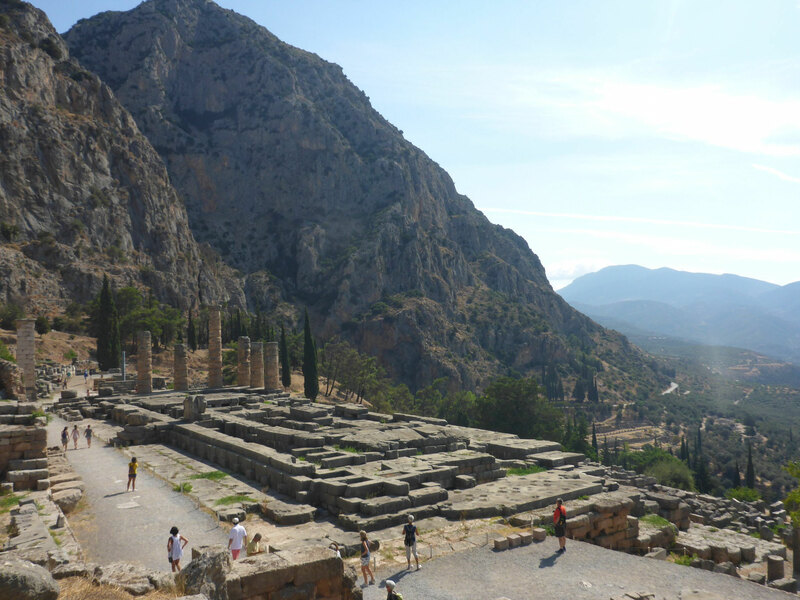 However, the temple, the treasure houses, art and portraits, and of course, the gymnasium and the stadium of Delphi, have impressed me. Did you know that the games of Delphi were the second largest sports games in ancient times? After the Olympic games. Oh, if we are talking about it. A main feature of the ancient Olympic Games was that all the wars in which the member states (usually city-states) were involved, were paused. A nice idea I think. It would be worth considering. Even if the implementation would be difficult in times of asymmetric warfare. 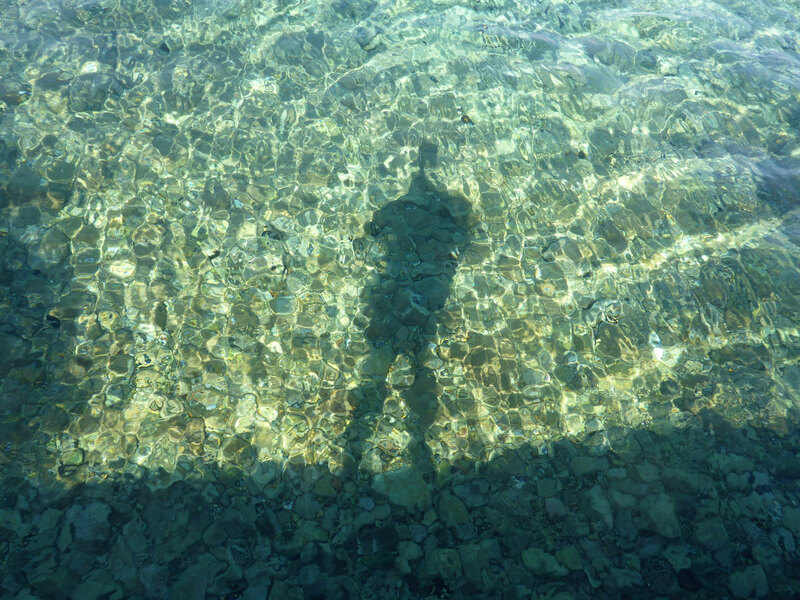 Next, I went to the sanctuary of Athena. Here stands the most famous building (or ruin) of the resort. It’s funny, because it has almost nothing to do with the most famous historical feature of the place, the oracle. Nevertheless, it is very impressive. The remains of the round building was partially restored and fits perfectly in the wonderful landscape of the valley, the vast mountain chain offers a unique, almost surreal scenery. This place, Delphi, has a unique character in any case. 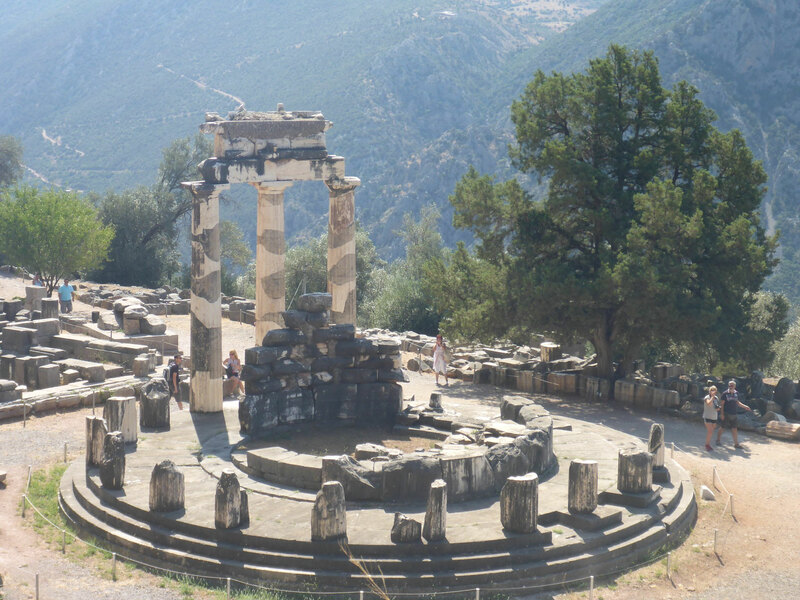 Whether it‘s the center of the world or not, whether the oracle spoke the truth or not, the region around Delphi has a very special, positive energy and beauty. For myself, however, I could pull no prophecy for my future. I do not need. Furthermore I just stay positive and optimistic. This automatically ensures a happy future. And the neurotoxic gases or hallucinogenic herbs that the Phytia, the female oracle of Delphi, probably consumed, are here no existent. So I don’t have any choice. I have spent some in the museum and did some small walks in and around the village. And of course, I have enjoyed the isolation in the hotel room. After 57 nights in dormitories, with up to twelve beds, it was time for some privacy. I could comfortably do my laundry in the sink of the bathroom, celebrate my beard trimming, sorting my equipment and my thoughts and give myself some rest. But three nights were enough. I had to get back to civilization. Real experiences with real People. I was very happy that I had already made contacts for my next destination. 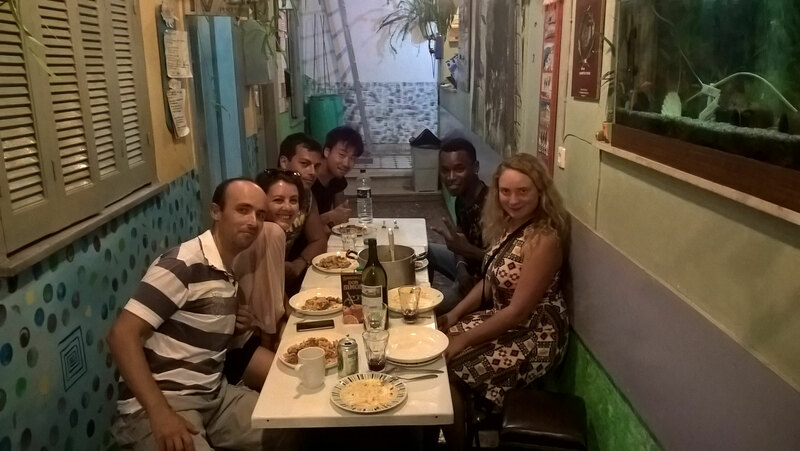 Due to the internet community couchsurfing.com, I met a nice lady from Patra. Well, I have written to her and asked if I can stay on her couch and if she likes to show me her city. Mariani, 34 and practicing psychotherapist has welcomed me with open arms. She shares her apartment with the primary school teacher Efthimia. Both are very personable, interesting and we have a good connection. Mariani took me out to the beautiful little taverns of the city. Under the trees of a small park a collective is running a small restaurant and we spent the whole evening at the small tables with tasty food and some Tsipouro (Like Raki, but not from Crete). The following day was a sad day. At the very beginning, the shocking reality: My beloved compact camera, with which I had so much fun, has died and I have wrecked my second sunglasses. I don’t give a damn about the sunglasses, I bought for five euros at the kiosk, but I am sad because of the camera. Unfortunately, there is no one in Patra, who can fix it. After hours of searching for a technician, we gave up. I can not yet, get over it and buy a new one. 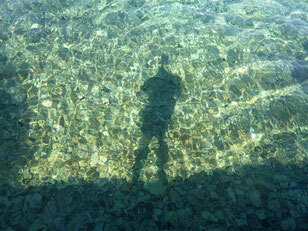 Anyway, we spent a wonderful day at the beach of the Gulf of Corinth. Very relaxing and quiet. The evening we spent in a very hip bar, on the roof of a building. The cool thing about the bar was at first the music, 50 / 60s rock'n'roll. Second, there was a large projector which projected silent films on the opposite building. Of course that was special and cool. On the following day Mariani showed me the most beautiful corners of her city. It is a pleasant city with about 300.000 inhabitants. They were also hardly seen any tourists. Nice to know that the high season runs out slowly. Patra, with its large ferry port, is the gateway to Italy and the Greek Ionian islands. After the castle, which we could not visit due to mistaken the opening hours, we visited some ancient Roman theater. Located near the waterfront, one of the largest Orthodox churches in Greece has just been completed. 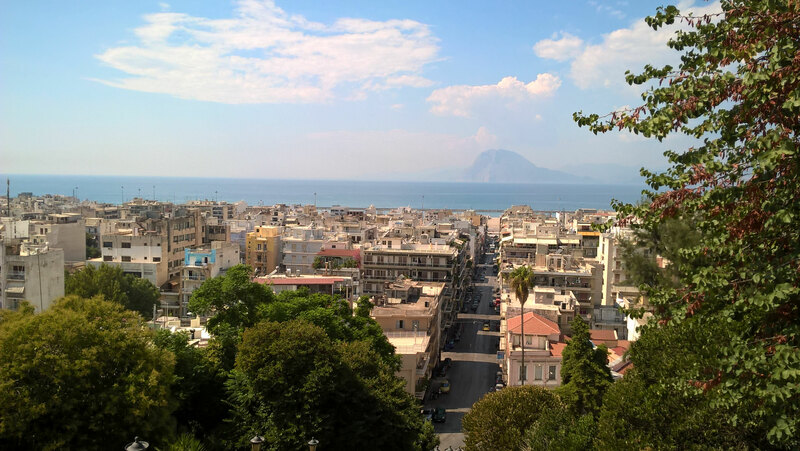 Patra is considered residential and place of death of the Apostle Andrew. Overall, I learned a lot bout the Orthodox Church. Mariani itself is not religious and we have spent much time talking about religion, their traditions, the problems that go with it, and discussed their omnipresence in society, but also in public life and politics. Unfortunately, Greece is still very far from secularity. Mariani also told me a lot about the political situation and the general mood of the Greek population and we discussed some of the challenges. Mariani is an activist for human rights and social volunteer. So many reforms and, unfortunately, a lot of time, insecurity and conflicts in Greece will be necessary to improve safety, tolerance, church, corruption, equality and justice in Greece to build upon modern, western values and to establish real democracy. receive my visit. I'll get back on occasion with new experiences here. That's for sure. - Schilli sits in a small Athenian taverna all by himself. The owner turns on the radio of shallow traditional music to electric trance rave techno something. Something to worry about? 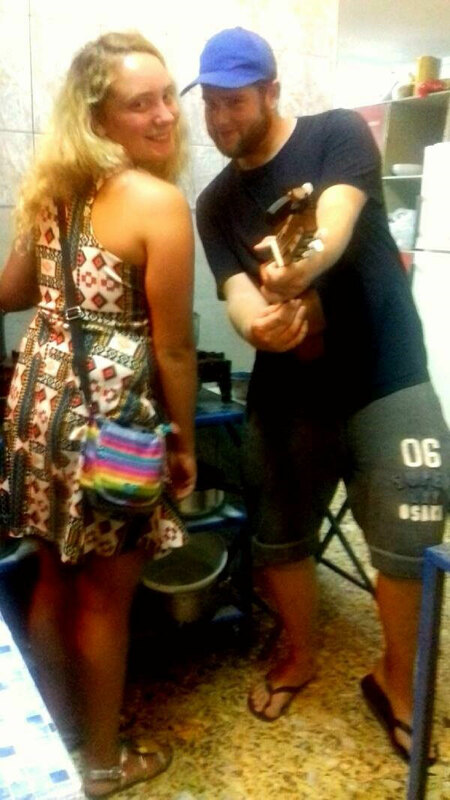 - Noah, a former stranger who I met at the music festival in Houdetsi / Crete, was asking me for some cash. I gave this stranger 50 € right away. Now he transferred the money. Trust awaking people can be trusted. - 4 days 4 different Pita, 1 tavern. Every day I have looked over in the small shop opposite my hotel and tried one of their pita specialties. - Whenever an Orthodox Christian gets by a church, whether on foot in the car, train, etc., he is obliged to cross himself, multiple times. It’s fascinating, when I'm traveling on the bus. A cute grandma did virtually nothing else than crossing herself for 1.5 hours. That’s endurance!